These beautiful, high-quality Isis Wings come with a carrying case and two wooden rods. 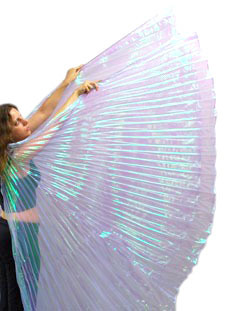 These beautiful, high-quality purple AB Isis Wings are a popular stage prop for belly dance, cosplay, worship, and more. Open back / split wing style - two wings attached at neck. Length: 54 - 57 inches (from neckpiece to bottom hem). *Wings will be shipped in a carrying case and with two rods, no additional purchase necessary. Q: I need petite length as I am 5 feet tall. Do you have in stock? A: Hi Aisa, we carry the GOLD, SILVER, WHITE OPAL, and GREEN OPAL in the petite size. At this time we do not carry the LILAC OPAL in petite.